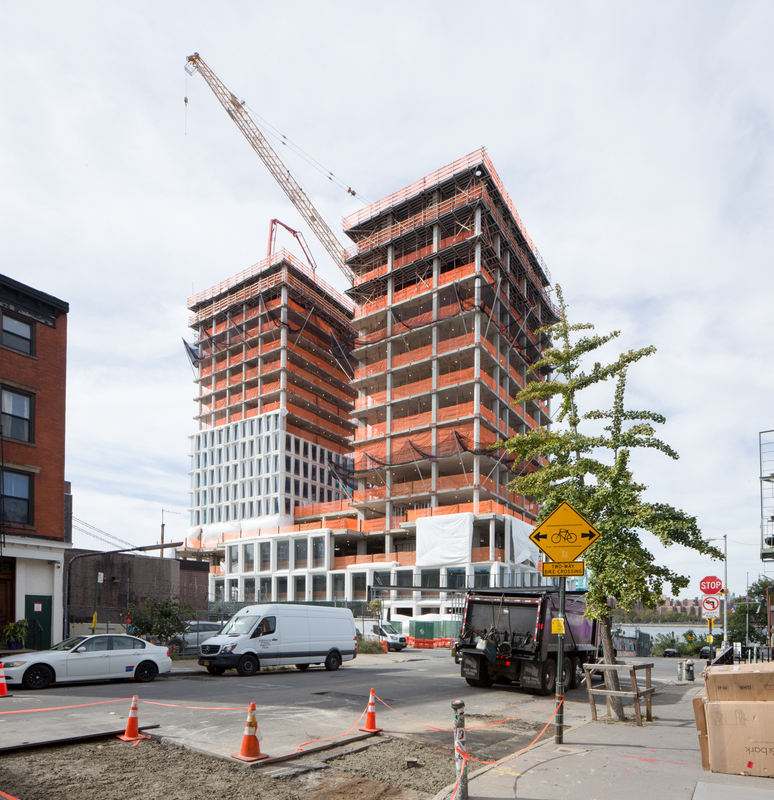 Glass is starting to rise at 260 Kent Avenue, and there’s something strangely pleasing about the new façade. The clean pre-cast concrete panels are shockingly white, and have deeply set back windows. The molecular pattern and forms of sugar crystals inspired the unusual design, as an homage to the Domino Sugar Factory that used to dominate the Williamsburg waterfront. 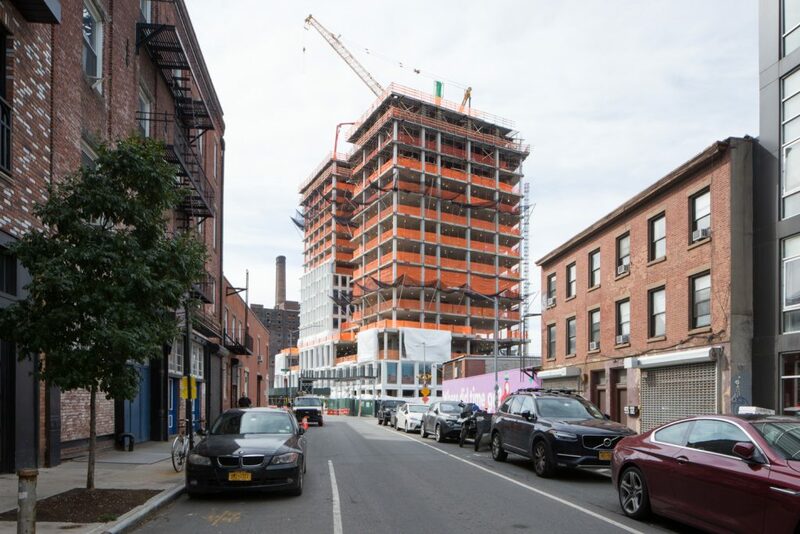 Concrete at 260 Kent has reached the 17th floor, out of a total 42. COOKFOX Architects are responsible for the design. 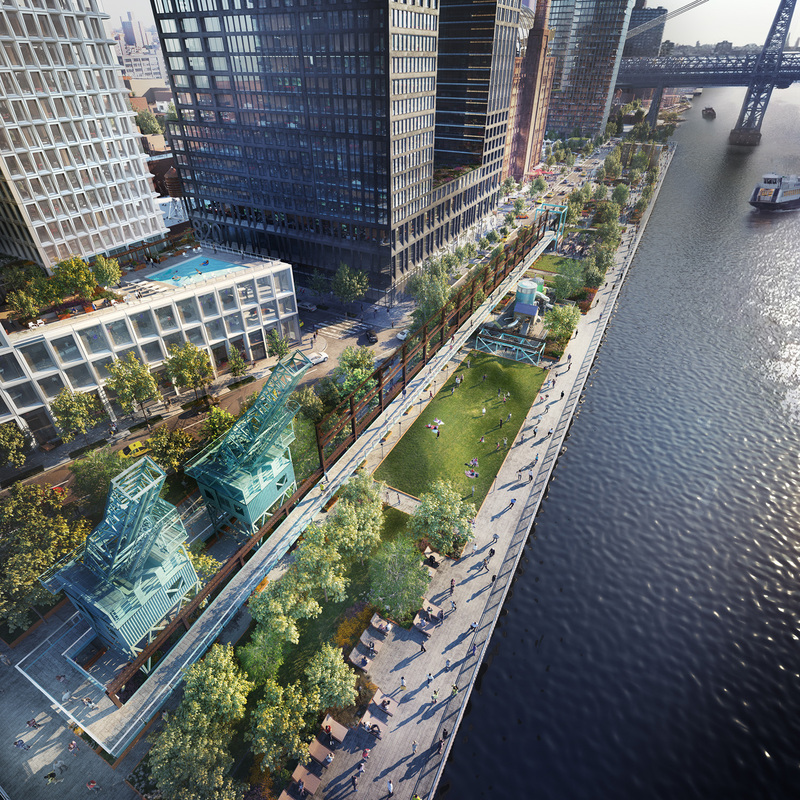 The 435-foot tall structure will yield 462,000 square feet. This will include a 22-story commercial section taking up 150,000 square feet. Along with 13,000 square feet of retail, 330 rental apartments will be created, of which 66 will be affordable. 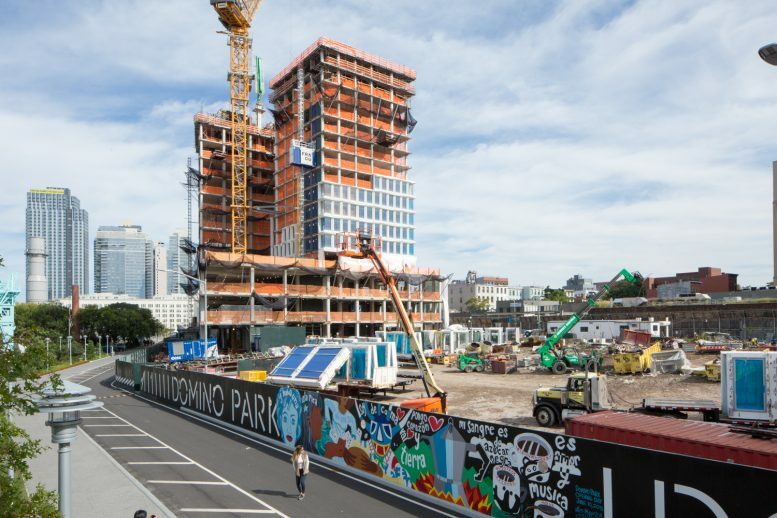 The building is surrounded by Domino Park, a new waterfront esplanade that opened up this summer to critical acclaim. Two Trees Management is responsible for the design. Construction started last year, and the estimated completion date has not been announced. 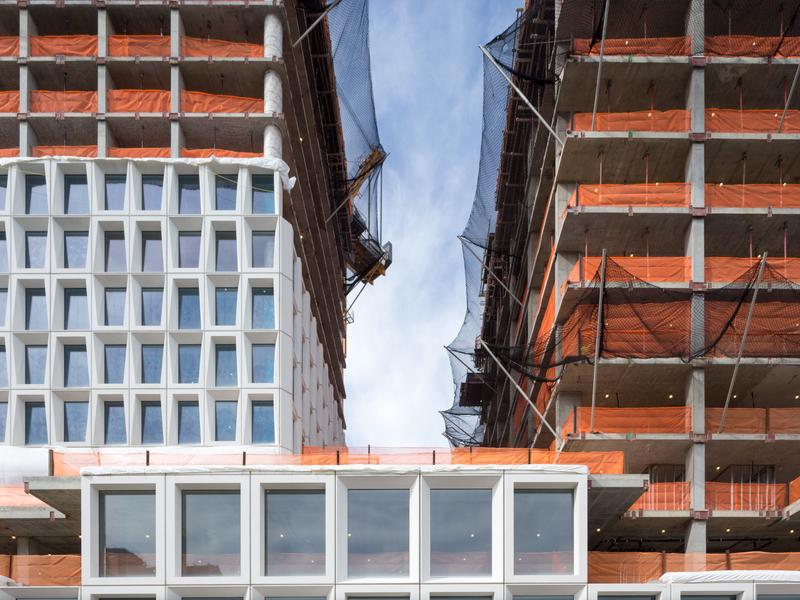 4 Comments on "Domino Redevelopment’s 42-Story 260 Kent Avenue Gets First Glass & Molecular-Inspired Facade"
Please pardon me for using your space: Do you like hackly facade? 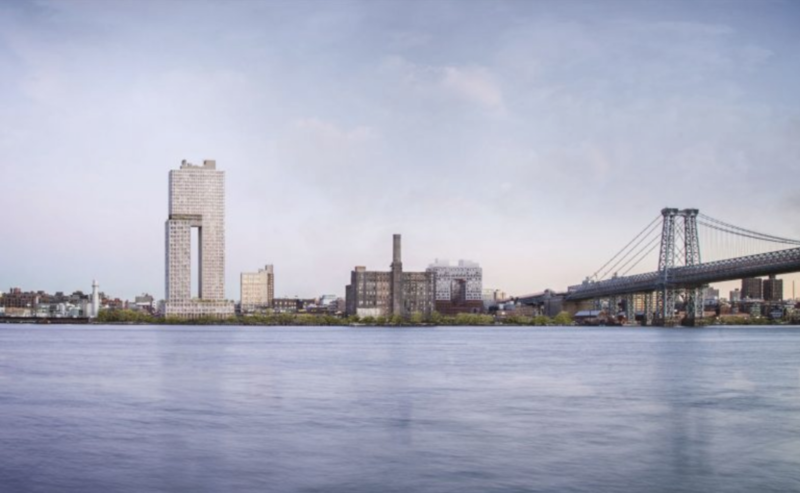 The molecular pattern and forms of sugar crystals inspired the unusual design, as an homage to the Domino Sugar Factory that used to dominate the Williamsburg waterfront. They should have given homage to the many who worked and slaved and even died in the sweat box conditions at the Domino Sugr factory over the last century or more. to the many people in the neighborhood who were driven out by rampant gentrification. as real estate developers further line their own pockets even further…. Please pardon me for using your space: But I have nothing better to do with my life.